Auto Arabia is the leading and most-influential motoring media in the Arab world. 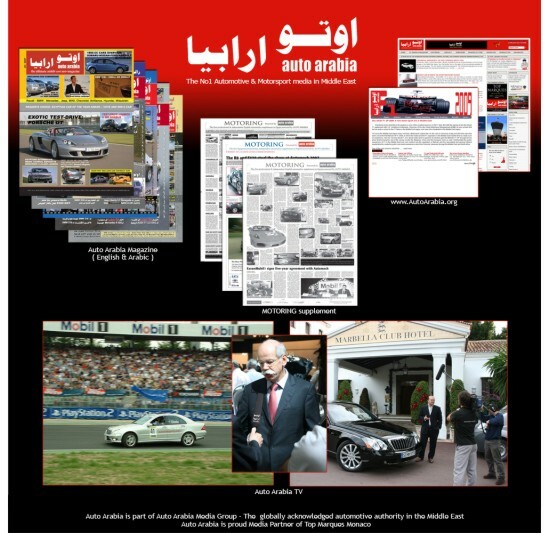 This status was reached through the comprehensiveness and diversity of the Auto Arabia Media Group, which includes two print magazines (English and Arabic), the largest and most up-to-date bilingual automotive online portal in the Middle East region www.AutoArabia.org , the Arabic TV show â€?Auto Arabia TVâ€™ as well as the newspaper supplement â€?MOTORING powered by Auto Arabiaâ€™. In addition to that Auto Arabia cooperates closely with several leading radio stations and TV stations in the Middle East region and Europe. With editorial and testing offices in Europe and the Middle East, Auto Arabia guarantees a significant and up-to-date coverage of the automotive field, the motor-sport scene and the Formula One scene worldwide, in a way which has not been available in the Middle East before, and which enabled AUTO ARABIA to be the sole opinion-making automotive media in the region from the start. Auto Arabia established itself very quickly as the number one media for the automotive and motor-sport industry through unrivalled coverage of exclusive test-drives and motor-sport events. The influential and opinion-making articles and test-drives of Auto Arabia made it not only the globally acknowledged automotive authority in the Middle East region, but also the perfect global media partner to reach a discerning, highly affluent and targeted Arab audience not only in the Middle East region, but also in Europe and the USA. The three main sections of Auto Arabia Magazine - automotive, motor-sport and life-style - cater the needs of the financially well-off Arab readers in every aspect. In the Motorsport section of Auto Arabia readers learn about the latest insider information in the extravagant Formula One business and read about the life-style issues related to the F1 and other high-end Motorsport series. In the Automotive sections readers find the latest automotive news and car launches, independent and professional test-drives and comparison-test as well as opinion-making features on automotive-related issues. In the Life-Style section Auto Arabia features the latest luxury accessories and gadgets as well travel stories to the most exclusive and exquisite hotels and locations. A lot of Auto Arabia readers are wealthy first-class and business-class jet-setters, who travel outside their home-country several times a year. They travel mainly for business trips, but also for shopping trips and vacations during which they spend substantial amounts of money on luxury treatment and personal enjoyment. They spend generously on all aspects of their lifestyle and travel, especially when this is related to the automotive aspect. They also love beautiful and striking life-style accessories and jewellery, especially Special Edition watches related to the motor-sport and automotive field, which they find in the magazineâ€™s and websiteâ€™s life-style section. Auto Arabia readers are fashion-conscious and very selective. They have large interest in cars as well as life-style accessories and are resolute to stay at the cutting edge of international style, so to be always up-to-date. Affluent, stylish and sophisticated, they have both the financial means and the inclination to treat themselves in the current automotive trends and always be ready to purchase the latest models and innovations. The readers of Auto Arabia love their cars to a very high extend, seeing it not only as a transportation facility, but also as a personal life-style feature, more than those readers of any other comparative magazine in the Middle East. Most Auto Arabia readers own several cars, not only in the Middle East but also in Europe. Auto Arabia is the only Arab car magazine represented in the renowned London-based International Engine of the Year Award â€“ also known as the â€?Oscarâ€™ of the motoring industry â€“ and is distributed not only through the largest distribution networks in the Middle East, but is also distributed in several first and business class airport-lounges, private jet companies as well as several many five-stars hotel suites and luxury boutiques in Europe and the Middle East.